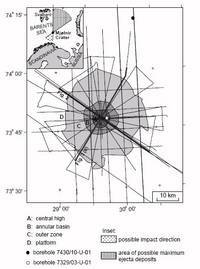 More than a decade of research has established the 40-km-diameter Mjølnir Crater as one of the best-preserved marine impact craters on Earth. The structure represents one of the very few cases globally where an intact source-crater and ejecta-layer correlation has been established. The easily accessible structure is located in the central Barents Sea at lat 73º 48´N, long 29º 40´E below ice-free waters. The drilling of the Mjølnir Crater will increase our understanding of marine impacts and impact-induced processes along with the post-impact development of the Arctic. In this relation both the stratigraphical developments along with environmental, climatological and biological perturbations should be emphasized.